The largest domestic natural gas drilling boom in history has swept across the United States. The Halliburton-developed drilling technology of "fracking" or hydraulic fracturing has unlocked a "Saudi Arabia of natural gas" just beneath us. But is fracking safe? When filmmaker Josh Fox is asked to lease his land for drilling, he embarks on a cross-country odyssey uncovering a trail of secrets, lies and contamination. 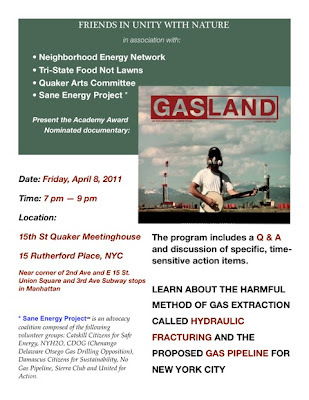 The movie GASLAND has also been sweeping the country, alerting citizens everywhere to the true price of natural gas, and mobilizing them in defense of the land that they love. If you haven’t seen it, now’s your chance. If you have, it’s a great way to come together with others who are equally concerned for the beauty, health and integrity of our natural environment. After the film, a question and answer period will address the repercussions of fracking in New York City’s watershed and the proposed natural gas storage and transmission pipe line entering Manhattan at the Gansevoort peninsula. An opportunity to take action and discuss sustainable alternatives will be offered to attenders. Sane Energy Project℠ is an advocacy coalition composed of the following volunteer groups: Catskill Citizens for Safe Energy, NYH2O, CDOG, Damascus Citizens for Sustainability, No Gas Pipeline, Sierra Club and United for Action. Donations for the upkeep of the Meetinghouse are gratefully accepted.